When is iPhone 5 coming out? It is really hard to figure out the answer for Apple has not confirmed iPhone 5 design is underway yet. But there are already many rumors about the new features of iPhone 5 which is said to make a debut in June. In the following, top 10 Apple iPhone 5 new features will be listed. When compared to 4.3-inch or 4.6-inch display from its rivals’ mobile phone, 3.5-inch Apple iPhone screen is quite small. So there are a lot of rumors stating that Apple iPhone 5 will adopt 4-inch or 4.6-inch screen currently. If it is true, the existed iPhone users might give up the existing equipment and take the benefits of a wide screen, for they can convert video to iPhone 5 and enjoy the ultimate visual feast. According to the latest rumors all signs indicate that Apple iPhone 5 will be launched in June. News from Apple supplier Foxconn said that Apple iPhone 5 will be released during Apple global developers’ conference and will be put into the market later on. Apple used to launch a new iPhone during this conference. Another rumor from Foxconn said that Apple is unwilling to launch iPhone 5 in June for iPhone 4S has been released not long before. So, Apple is reportedly considering launch iPhone 5 in October so as to provide enough time for iPhone 4S to produce great profits. Almost everyone takes it for granted that iPhone 5 is also with the 4G LTE connection at the time the new iPadis equipped with this function. Now there are lots of rumors confirming this speculation. However, it remains unknown that how will Apple handle the battery consumption problem caused by LTE support. Apple iPhone has been using the same glass design for two years. 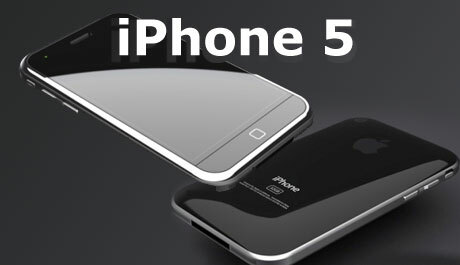 Therefore, the iPhone 5 is likely to own a totally different appearance. According to Brian White from Topeka Capita IMarkets the new iPhone will use unibody design which is different from iPhone 4S. By convention, the new processor will be applied to iPad and then to the next generation iPhone. Rumors reveal that iPhone 5 will adopt the same rule: taking A5X into use. Dual-core processor and quad-core GPU are included in A5X. The biggest problem of iPhone lies in that it is without 1GB of memory. As for more advanced smartphone, the greater the memory, the more popular the mobile phone will be. Apple has recognized this problem and plans to provide the nest iPhone with 1GB memory according to recent reports. Images shot by Apple iPhone are the most popular on photo sharing website—Flickr, and using Apple iPhone to shoot pictures is the most ideal way in daily life. Consequently, there are rumors that Apple will make a great improvement on iPhone 5 camera, including panoramic shooting support and 8-million-pixel image quality. Many companies within Mobile Area have to take the advantage of mobile payment. Due to the reason that iPhone is without NFC technology support, Apple has not provided users with mobile payment ability so far. Reports stated that iPhone will support NFC technology. Does this mean that Apple will launch mobile payment solutions? Apple has been using the same base port to let users charge for equipment, transfer data and perform other tasks for years. But it is reported that Apple is considering improving its base connector so as to make it more useful. iPhone 5 will be the first to adopt the new port.